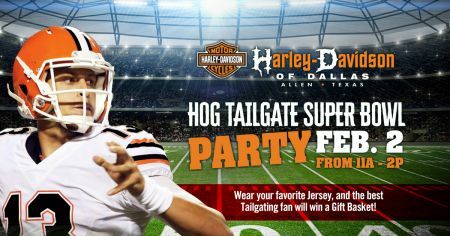 Yep, you get to enjoy Harley-Davidson® motorcycles and the Super Bowl all in one place -- here in Allen, Texas on February 2. Wear your favorite Jersey, for a chance to win a Gift Basket! Test Ride any 2019 Motorcycle and be entered to win $100 in store gift card. Bring any tee shirt in from another dealer and exchange for one of ours! Some restrictions may apply. Please see dealer for details.